Directed by Wang Jiuliang. 2011. 72 minutes. In Mandarin w/ English subtitles. The very mention of Beijing conjures images of its imperial past – landmarks like the Forbidden City and the Ming tombs. Soon that may change. 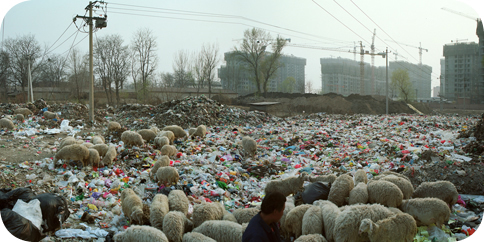 Film director Wang Jiuliang’s cinematic reportage draws our attention to the fact that Beijing’s landfills now far outnumber its landmarks. From 2008-10, Wang counted close to 500 dumps and landfills surrounding Beijing, almost like a moat, and piled high like a tumulus. Some of them are only 10 miles from the Forbidden City, Bejing’s heart and center. Using a combination of Google Earth, photography, video, and thought-provoking commentary, Wang Jiuliang juxtaposes Beijing’s rapid urbanization, often touted as an economic miracle, with the negative environmental and social consequences of the city’s expansion. He begins with footage of newlyweds taking photos by a creek and cuddling sheep, an idyllic scene if it were not for the toxic water in the creek and the fact that the sheep are feeding on nearby garbage instead of grazing in the mountains. Clearly, the couple has no idea how their own lifestyle is contributing to what can only be considered a looming environmental disaster. The collision course between the increasing amount of trash, the need to develop real estate as demand for living and work space grows, and the gap between rich and poor is further highlighted by the subtle panoramas of construction cranes in the background and high speed trains wizzing by scavengers living in the dumps. The scavengers come from all over the country and build a life picking through the garbage, with hopes of bettering their own lives. They erect houses from construction waste, dress themselves in tossed out clothing from wealthy Chinese, and feed themselves from whatever edible waste they dig out of the rubbish. Among the scavengers are farmers, who have also made a home in the dumps, grazing their livestock of sheep and cattle in the refuse, or raising pigs from the swill and even extracting oil from it, which they then surreptitiously sell as cooking oil. Wang interviews, photographs and films the all this, always with dignity, showing the utmost respect for their situation. These scavenger communities eventually become displaced as the dumps are converted into landfills and then into golf courses or, as Wang ironically points out, as the location for an international horticultural exposition. In one year, a landfill can be transformed into a cornfield or an international school. Even though the landfills are reincarnated as ‘farmland’ or the foundation for modern buildings, the ramifications of eating food grown on toxic land and with polluted water, or living above a landfill, are yet to be determined. The situation has become almost too big to control. Although there are waste treatment centers and Beijing residents are charged a fee for waste management, there is simply too much garbage and not enough regulation or control. Many illegal dumps spring up and untreated waste is dumped into waterways. Wang’s two-year survey ultimately yielded 10,000 photos and 60 hours of video footage from nearly 500 landfills. Exhibitions were curated from his materials, causing a sensation and leading to an investigation by Xinhua, China’s official news agency. Eventually, the Premier, Wen Jiabao, took action and initiated a series of policies on waste disposal, Beijing Besieged by Waste serves as an example of the power of cinematic reportage in China today. This film is appropriate for high school and college level students. It addresses topics related to the environment, consequences of rapid urban development, the growing gap between rich and poor, and the increasing role of investigative reporting and its potential impact on policy-making and public awareness. France Pepper holds an M.A. in East Asian Studies from McGill University. She is the Founder and Director of China Insider, a China cultural consultancy. Previously, she was the Director of Arts and Culture Programs at China Institute for 11 years. Beijing Besieged by Waste will soon be available for purchase on DVD at dGenerate Films.